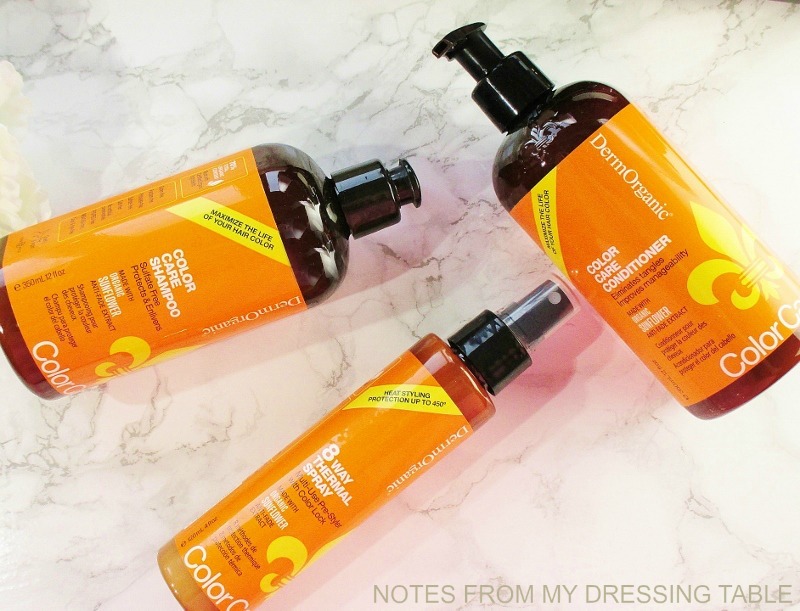 I am a fan of the DermOrganic hair care line so I was delighted when I was offered the opportunity to test drive and share with you my thoughts on their new Color Care Line. 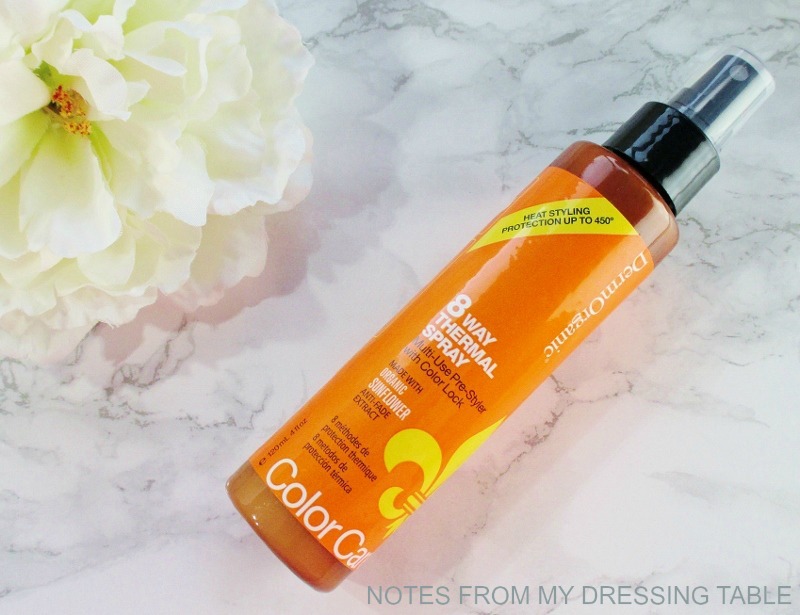 Comprised of three products and formulated specifically for more delicate, colour treated tresses, these products gently cleanse to maintain colour integrity, deeply hydrate and protect strands from heat styling and environmental stress. 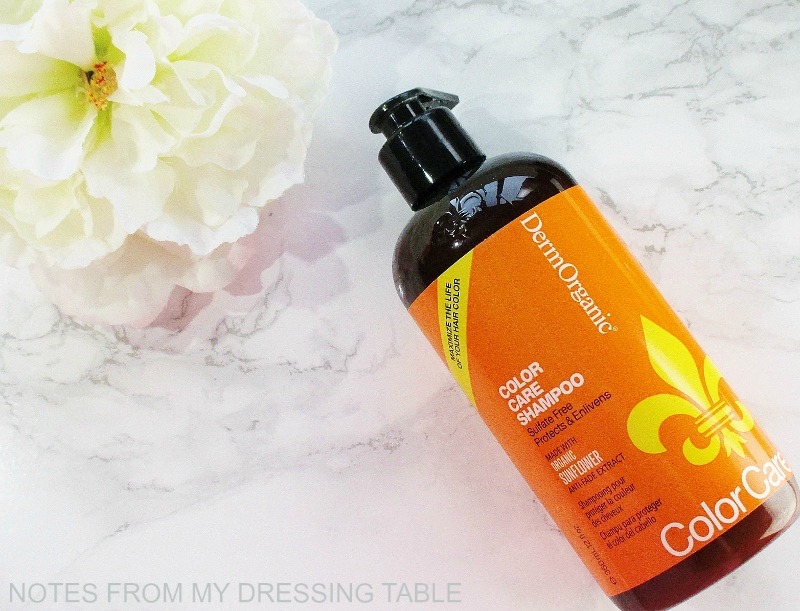 DermOrganic Color Care Sulfate Free Shampoo is a gentle, 70% organic creme shampoo formulated with skin care ingredients, lipids and a low PH that delivers a soft, cushioning lather to cleanse completely while protecting against colour fade. Softly scented with a soapy-clean, slightly sweet almond fragrance, this shampoo is as easy on the senses as it is on my tresses. Organic Aloe Barbadensis Leaf Juice, Aqua/Eau/Water, Disodium Cocoyl Gluta-mate, Decyl Glucoside, Sodium Cocoyl Isethionate, Cetearyl Glucoside, Methyl Gluceth-20, Organic Argania Spinosa Argan Kernel Oil, Rice Amino Acids, PCA, Panthenol B5, Organic Helianthus Annuus Sunflower Seed Extract, Organic Vitis Vinifera Grape Seed Extract, Tocopheryl Acetate, Organic Citrus Aurantium Dulcis Orange Peel Extract, Organic Chamomilla Recutita Matri-caria Extract, Organic Cucumis Sativus Cucumber Fruit Extract, Organic Salix Alba Willow Bark Extract, All Natural Preservative Propanediol/Phenethyl Alcohol Aromatic Extract/Benzoic Acid Food Grade, Parfum/Fragrance. 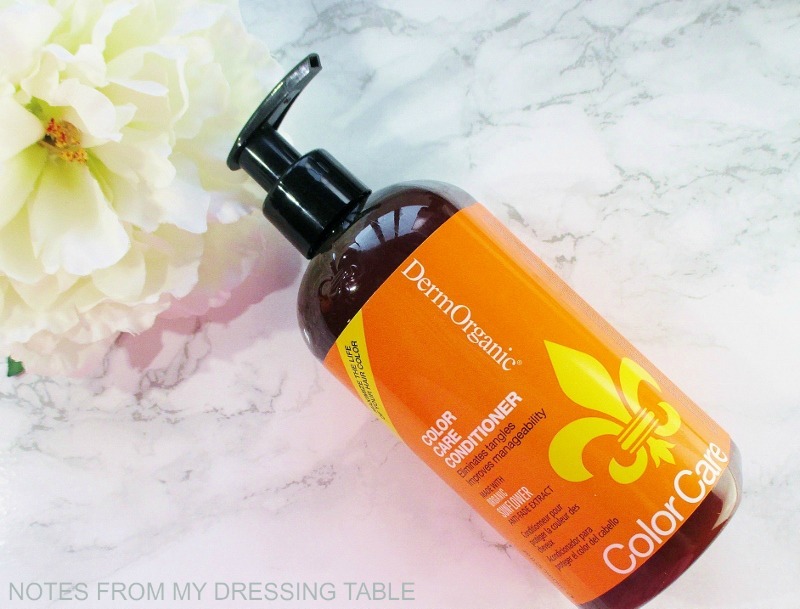 DermOrganic Color Care Conditioner is formulated with 72% organic ingredients including moisture packed lipids and hydrolyzed rice protein to hydrate, soften, detangle and reduce flyaways. Natural solar shields help to protect hair colour from UV exposure and fading. 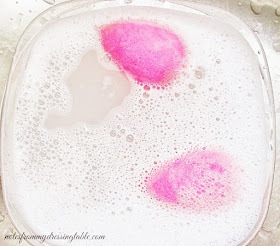 This rich, creamy conditioner spreads readily to saturate every inch of my hair. Comb out with conditioner in is good, not quite hot knife through butter but not bad, for my wurly, tangle prone tresses. Rinse out is fast and easy and my hair feels cared for and hydrated but not heavy or weighed down. There is a light, sweet, softly almond-ish scent that is pleasant but not overwhelming that doesn't linger for long. Organic Aloe Barbadensis Leaf Juice, Aqua/Eau/Water, Caprylic/Capric Trigly-ceride, Stearalkonium Chloride, Stearyl Alcohol, Cetearyl Alcohol, Organic Argania Spinosa Argan Kernel Oil, Panthenol B5, Rice Amino Acids, Methyl Gluceth-20, PCA, Tocopheryl Acetate, Organic Helianthus Annuus Sunflower Seed Extract, Organic Vitis Vinifera Grape Seed Extract, Organic Citrus Aurantium Dulcis Orange Peel Extract, Organic Chamomilla Recutita Matricaria Extract, Organic Cucumis Sativus Cucumber Fruit Extract, Organic Salix Alba Willow Bark Extract, All Natural Preservative Pro-Panediol/Phenethyl Alcohol Aromatic Extract/Benzoic Acid Food Grade, Parfum/Fragrance. DermOrganic 8 Way Thermal Spray hello to 73% organic ingredients, detangling, heat protecting, makes my dried out hair feel like silk, smells like old school Jergen's cherry almond goodness. I minimize heat drying and styling but I always treat my hair to as much nourishing, caring stuff as I can possibly get away with piling on to it. This spray in treatment allows my comb and brushes to glide while Argan Oil, moisturizing EFA Lipids, and restorative Rice Amino Acids help protect vulnerable strands from heat up to 450 degrees. Organic Aloe Barbadensis Leaf Juice, Aqua/Eau/Water, Cetearyl Alcohol, Behenamidopropyl Dimethylamine, Stearyl Alcohol, Caprylic/Capric Triglyceride, Polyquaternium-10, PCA, Organic Argania Spinosa Argan Kernel Oil, Methyl Gluceth-20, Rice Amino Acids, Panthenol B5, Dimethicone, Organic Vitis Vinifera Grape Seed Extract, Organic Helianthus Annuus Sunflower Seed Extract, Tocopheryl Acetate, Organic Chamomilla Recutita Matricaria Extract, All Natural Preservative Propanediol/Phenethyl Alcohol Aromatic Extract/Benzoic Acid Food Grade, Parfum/Fragrance. DermOrganic products are formulated with at least 70% Organic Ingredients, are free of Sulfates, Salts, Parabens, PABA, Propylene Glycol, Petroleum, MEA, DEA, Artificial Colours or Dyes. PH Balanced 4.5 - 5.5. DermOrganics products are Vegan and proudly Cruelty Free. You can buy DermOrganic hair care from Ulta Beauty and at select salons. Have you tried DermOrganic hair care? 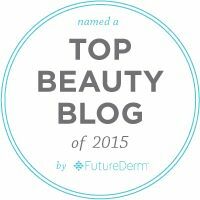 What are your favorite products from this line? Please do tell.